I am an avid supporter of organic farming and gardening, and am fortunate enough to live right around the corner from my town's weekly farmer's market. 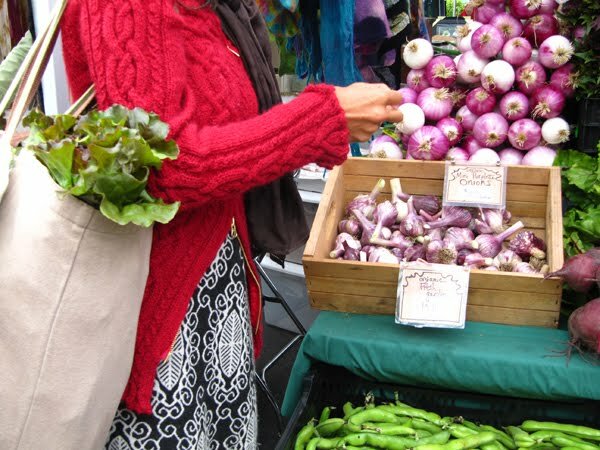 Every Saturday morning, after I have my coffee, I grab my cloth bags and head over to buy organic eggs and produce from the local farms — perhaps picking up a special sweet treat for a loved one while I'm there. ABOVE: This bag is the adult DIY messenger bag, made from the pattern in Kata Golda's Hand-stitched Felt using the materials from my DIY messenger bag kit (# 09-28-501). Fill it up with potatoes and corn and other greens; it can hold a lot of weight. Dry it out on the clothes line if the greens make it wet. It's made with nice hand-dyed quality wool that it will keep the moisture to itself and dry out fairly quickly, unlike cotton (wool has a bad rap with the heat but it is actually more comfortable than cotton — although I am speaking as a Pacific Northwesterner and not as one who suffers great humidity in the summer months). You can imagine my excitement when Colinwood Farm in Port Townsend, Washington (liveorganiclife@yahoo.com / 360-379-9610) asked me to make the sign for their market booth. They wanted a banner that reflected their simple, small, hard working, 'hand-made' farm — one that reflected who they are: not a big fancy impersonal place, but a small family on a plot of land in a small town. I loved making this sign. We started by choosing the dimensions. Once that was solidified, we talked about color. They sell a lot of potatoes, but a radish or a beet is much more visually appealing than a potato and they wanted a sign that had a full spectrum of colors. The rest was up to me. I staged the felt for the background on a large table and started by cutting the letters freehand, one at a time, making sure they fit within the banner. Then came the addition of the vegetable shapes, which is where I was able to work in a variety of colors. Spreading everything out on my large work table, I was able to play with the placement of all the elements... and it didn't take long to realize that there was a lot of visual clutter on the sign. All of the elements Colinwood Farm had requested were there, but we agreed it was a bit much. It was then that I got down to the heart of my creative process: as soon as I've created an unintentionally cluttered visual display, I step away from it for a bit, then repeatedly revisit it in small spurts to change elements — sometimes removing entire sections — until it's just right. 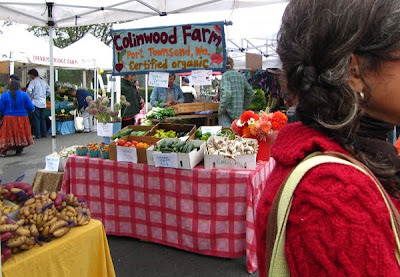 For example: In an early version of the Colinwood Farm's sign, there had been a big rainbow of color over the farm name — but it took too much of the attention away from the name itself. So I removed it and instead added color by varying the felt of each line of type. It was a small solution that accomplished what we wanted without sacrificing the legibility of the sign. Tacking everything down with a dab from a glue stick, I let the design rest for a bit, save for a few small letterspacing changes made here and there. Finally, it was ready for the final stage: stitching. 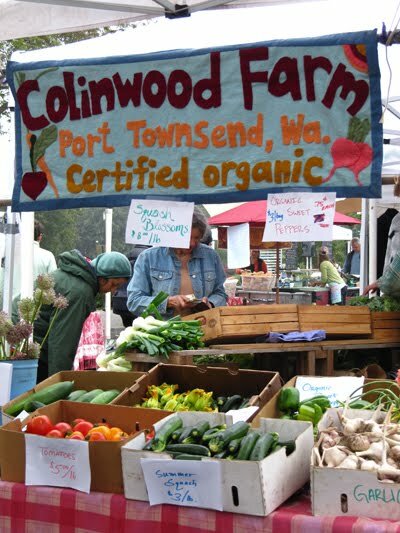 The sign now hangs above the Colinwood Farm booth on a thick wood dowel, held in place by felt sleeves on the back of the banner, and I'm proud to see it every time I visit the Port Townsend Farmer's Market on Saturdays (to which I'm going in about an hour). Thanks for the opportunity, Colinwood Farm, to work together. Visiting your booth always brings me such joy. Want more? Seattle Times featured a photo of Colinwood Farm (and their banner!) at Seattle's Olympic Sculpture Park Farmer's Market. NPR's Marketplace recently aired a story about the rise in farmers markets, and has a slideshow of photos on their website.